Don't laugh. Today's post is something we came up with the other day on the spur of the moment and is kind of random. It uses several of our favorite tools (whiteboard markers and tape), so it actually was a hit... but isn't something you've probably thought to do before. I don't know how vacation affects your house... but I kinda let the TV/iPad rules slide a bit... so I am paying for it this week. We are having constant battles about "playing" versus sitting and watching Land Before Time on the iPad. Grr. Totally my fault though. In an attempt to be more cool than the iPad, we grabbed whiteboard markers and drew on the glass sliding door (it comes off with a paper towel). I added a piece of paper on the other side of the glass so that we could see the mittens better. We wrote the numbers 1-10 on the mittens (with whiteboard markers so that we could erase them and do higher numbers or change it up as we wanted). We've been reading Jan Brett's, The Mitten, so mittens fit with the theme of the day (though it is in the 60s+ in California- crazy winter!). For the first activity, we grabbed a nerf football and threw the football at the mittens. We tried to hit specific numbered mittens. This was a lot of fun and worked on hand-eye coordination and aim too. Next up, we grabbed painters tape and ripped it into tiny pieces. 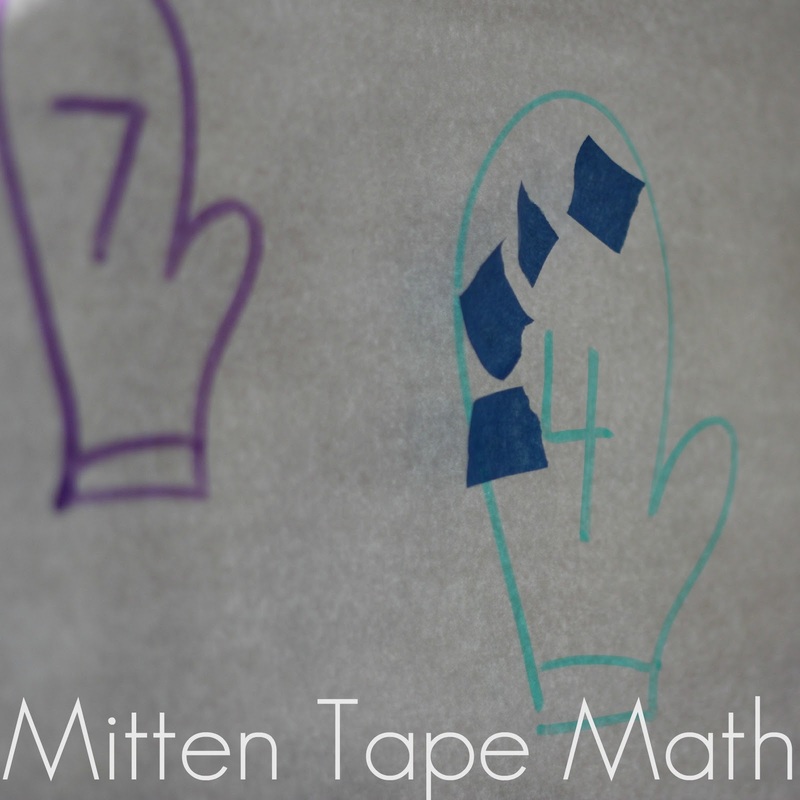 Then we tried to put the correct number of tape pieces on each mitten. We could've just used dot stickers, but ripping the tape was good practice for little fingers. The little guy was intensely focused on making sure each mitten had the correct amount of tape pieces on it before we could be done. Do you have any other favorite mitten themed activities? how fun! I have never thought to write on our glass doors with the whiteboard markers! I must try this - I know my girls will LOVE it. Thanks for sharing on the Sunday Showcase - I shared on FB & Twitter.